With each tutorial I demonstrate what I am describing and then I sum it up at the end of each lesson. You can follow along and try out what I am demonstrating for yourself. The lessons are created by myself, Dan Wassink. I’ve been creating tutorials for over 10 years and have helped thousands learn more about their Apple devices through my tutorials. • What the different features for AutoFill fill are and how to enable them. 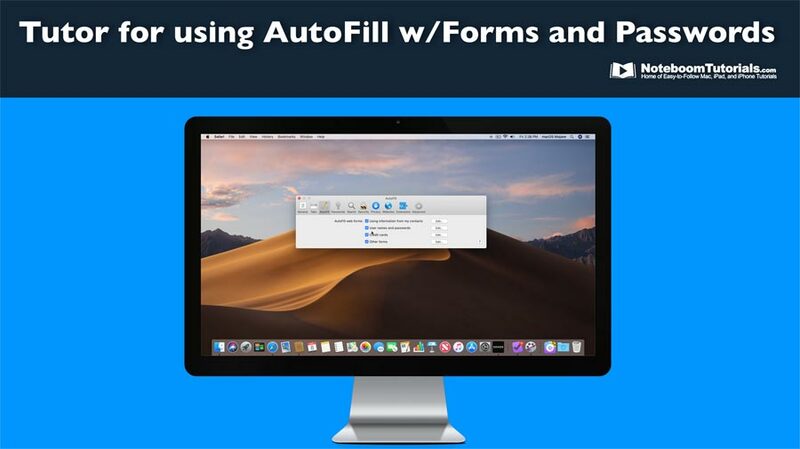 • How to reduce the risk of someone using AutoFill on your Mac while you are away. • Using your contact information to AutoFill a form in Safari. • Saving your username and passwords when on a site in Safari. • Autofilling usernames and passwords when visiting a site you’ve visited before and you need to log in. • Create strong passwords for websites. • Entering credit cards into Safari and then using those credits cards when purchasing online. • Deleting information from websites when used for other forms.